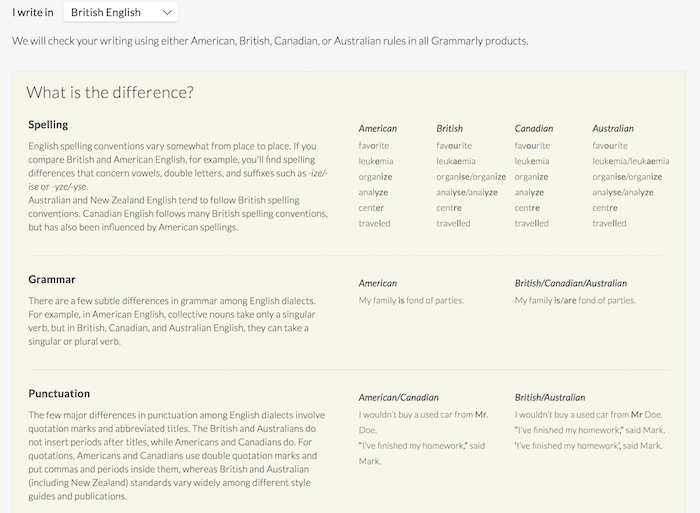 If you have arrived at this page, you probably want a quick answer to one of the following questions about Grammarly. To save you time before you read my full review, here are the four most common questions, with my very quick answers. 2. Is Grammarly any good? 4. Is it worth paying for the premium version? 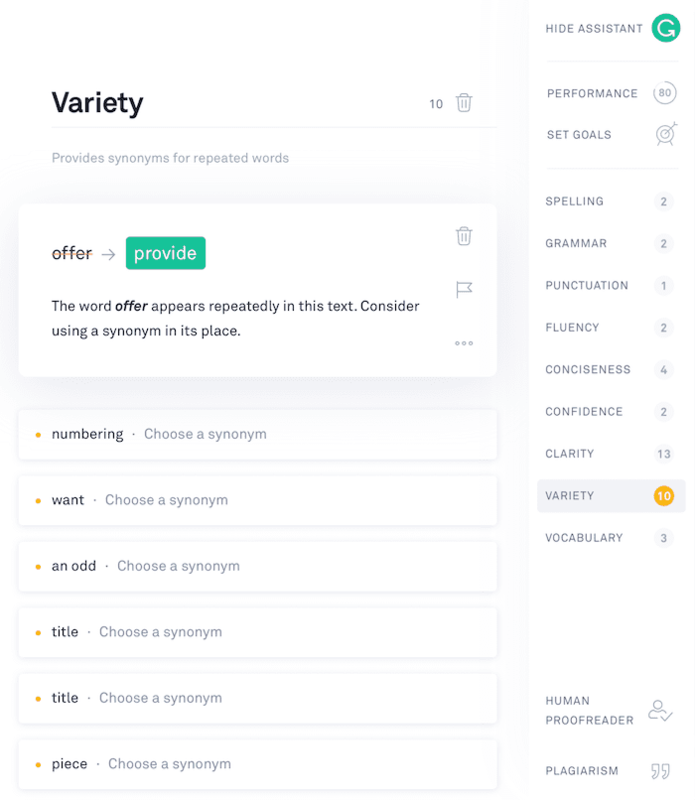 Grammarly is an online grammar, spelling, punctuation and writing checker. Writers use it to help correct and improve many different forms of writing. It is a very popular writing tool for bloggers, article writers and authors as well as students and occasional writers. Yes, it is very, very good. In fact, it is now one of my most indispensable writing tools. I use it all day, every day. 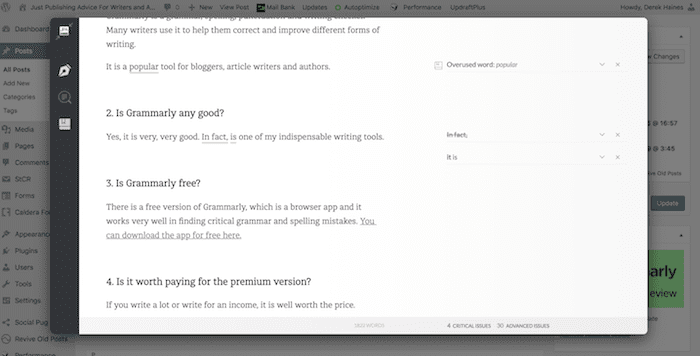 Yes, there is a free version of Grammarly. It is a browser app and it works very well in finding critical grammar and spelling mistakes in your writing. You can download the app for free here. If you write a lot or write for an income, yes, it is well worth the price. However, if you are a student or occasional writer the free version will most likely be all you will need. For a writer, typos and grammar errors are a killer for your reputation. That is why I rely on a little writing help from Grammarly. You might find it surprising that I admit to using an online grammar checker to help me correct my writing. But if you are like me and you write a lot of short texts on the Internet, you’ll know that it is hard to avoid making errors when you are writing in a hurry. Whether it is on Facebook, Twitter or blog comments, I try to make sure that even my shortest social media posts or replies to comments are free of spelling and grammar errors. It is one of the first ways that it shines. It is so easy to write a quick comment or reply and make a silly mistake. It is amazing how fast the Grammar Police can attack even the smallest error. 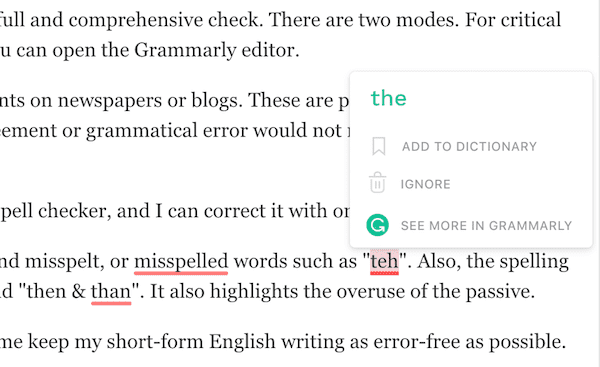 With Grammarly, correcting silly typos is easy. All it takes is one click to correct an underlined error. The same can be said for long-form writing, but at least there is more time available to check, find and correct grammar errors. The grammar and spell check in Microsoft Office is extremely limited. Because of that, I started trying a few online spelling and grammar checkers years ago, but none of them worked completely to my satisfaction. They all helped in some ways, but I often found myself changing the suggested corrections because the recommended sentence structures didn’t feel natural. Perhaps because they were based too strictly on grammar rules. Very few of the free apps I tried detected complex issues such as sentence fragments or run-on sentences. Perhaps I had a hang-up with free apps, or maybe I was too critical. But after trying a lot of free apps, it was clear that Grammarly was by far the best. In the end, because I found myself using it so often, I finally decided to grab my credit card and pay for the premium version of Grammarly for a few months. That was well over three years ago now, and it was one of the best decisions I have made to help improve my writing accuracy. Even though I had used the free version previously, I didn’t realise how many advanced grammar tools the premium version offered. 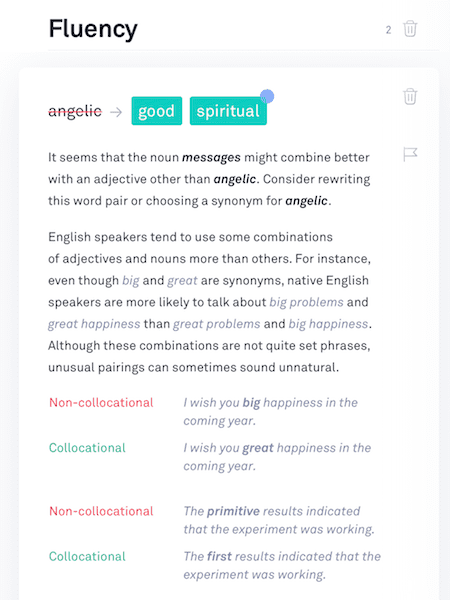 The free version of Grammarly does an excellent job of finding critical grammar and spelling mistakes. But the premium version allows you to access a much more in-depth analysis with an extended range of checks and tools. Once I started with the premium version, I found that it worked with everything I use to write online, and almost everywhere I typed in either Safari, Chrome or Firefox browsers. It really helps you write more accurately when you are in a hurry by highlighting spelling and grammatical mistakes in an instant. One of the differences over other similar apps is speed. It is super fast and never lags or locks up. I have a habitual typo tic when typing ‘the’, which so often comes out as ‘teh’. It’s annoying. However, Grammarly fixes it for me every time. It meant that my Facebook and Twitter posts and replies were automatically scanned for errors. Not only that, but it also worked seamlessly with my WordPress editor when I wrote my blog articles. Then I downloaded the editor desktop app, and it immediately became indispensable for checking my long-form writing. I ran a few chapters of one of my already published books and was quite horrified to discover quite a few errors that had escaped a lot of human eyes. Not many, but enough to realise that a little extra help can go a long way. After my first three-month subscription expired, I was convinced and bought a twelve-month subscription. I feel that although I know that I know how to write, my stumbles or laziness, especially online, are less likely to result in silly, embarrassing errors. 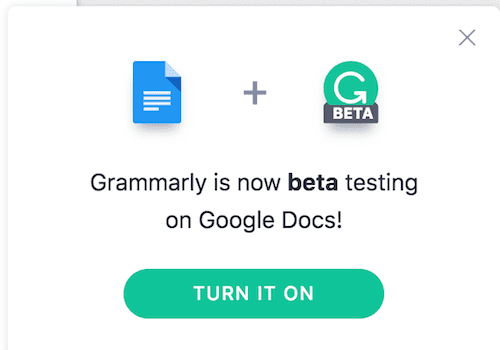 Grammarly works in real time in most browsers. But I use it predominantly with Safari and Chrome for my WordPress sites. It works seamlessly with the WordPress editor and feels like it is a native plugin. When I am writing blog posts, I usually turn it off while writing, because I do not want to be distracted. But when I finish the first draft, I turn it back on to conduct a full and comprehensive check. There are two modes. For critical errors, these are underlined in red in my editor. 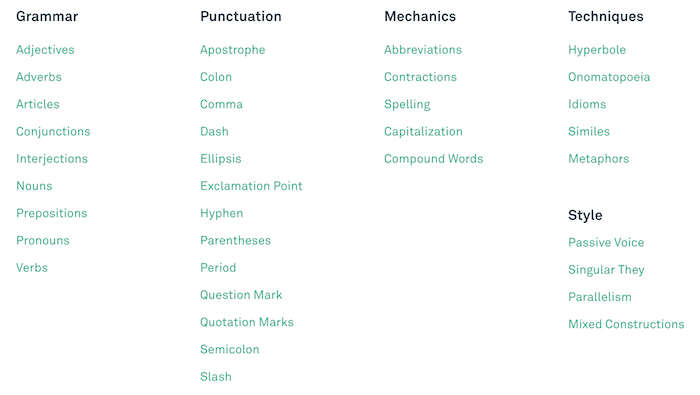 For deeper analysis and correction, I can open the Grammarly editor from within the WordPress editor. Where it also comes in very useful for me is when I post comments on newspapers or blogs. These are posts that I always want to ensure are error-free, as making even a small spelling, verb agreement or grammatical error would not reflect well on me as a writer. With it activated, any small error is picked up by the spell checker, and I can correct it with one click. It has saved me many times, particularly for little typos and misspelt, or misspelled words such as “teh”. Also, the spelling check can find contextual spelling errors such as “its and it’s” and “then & than”. It also highlights the overuse of the passive. Grammarly works perfectly for all of my online work and helps me keep my short-form English writing as error-free as possible. I don’t like distractions when I am writing a novel in word processors like Microsoft Word, so I always turn off the auto spelling and grammar check, because all those red and green underlines are annoying. However, I then run a check once I have finished a chapter. Now though, I always run my writing through Grammarly. There are two ways to access the editor. One is the online editor, and as I am a Mac user, I also have the desktop editor. The choice of settings in the editor is far more extensive than in Microsoft Word. It allows you to set a range of different types of documents, depending on the writing style. It is one of its biggest advantages for me. When I first started using Grammarly, I made the mistake of doing a copy and paste into the editor but discovered that all my formatting was lost. It can integrate with Word, but only for PC users. I use Apple, so, unfortunately, this facility is not available for me, but hopefully, it will be in the near future. To get around this small issue, I learned that I could quickly upload my completed chapters in Word docx, and once I had finished the check and corrections, I could export it back in Word format without losing any of my text, font and paragraph formattings. While it picks up almost all grammar and spelling errors, what I like the most about it for long-form writing is that it finds repeated words. In long passages of text, this is something that is often difficult to notice and it is a huge time saver for me. Another correction tool I find very useful is one that highlights inappropriate collocations. 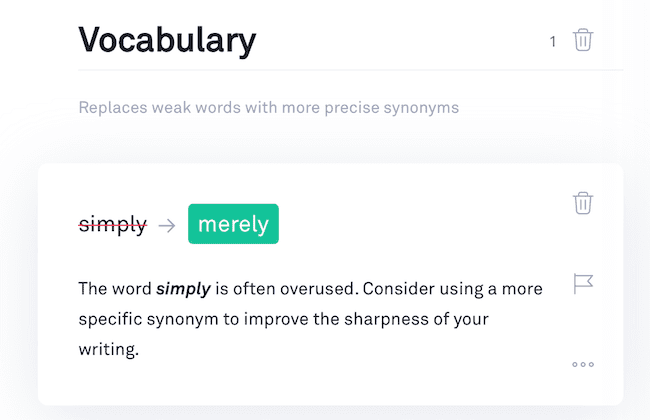 Grammarly calls it fluency. Having information such as in the image above at my fingertips when doing a preliminary edit is a huge advantage. The more errors I can find and improvements I can make during my first draft saves me hours of work later on. When you use the editor, every suggestion comes with a card or a series of cards to help you make informed choices for corrections or re-writing. Every card gives you an explanation and an option for improvement. If you click on an error count in the right-hand assistant sidebar, errors are then listed in a series of cards. Working through the marked corrections and making the necessary changes is then a quick and easy process. With the Grammarly editor, every facet of your writing is checked. It is then up to you to make the best decisions about how to improve your writing from the listed suggestions. Another great feature is that you can select from four versions of English. Not only US and British English but also Canadian and Australian. You can also get a full and detailed report about your text from the editor. Reading time, speaking time and a readability score are all useful data segments. You can type and work directly in the editor just the same as you would use a word processor. All your work is auto-saved, which is a bonus. If you want to write free of distractions, you can hide the writing assistant. However, you would probably use the editor mostly for uploading and checking documents. Supported files are Microsoft Word .doc, .docx, and OpenOffice .odt, as well as .txt and .rtf. If you are using the extension for Word and Outlook, there is no document size or page limit. However, when using the editor, there is a file upload limitation of 100,000 characters. It equates to about 20-25,000 words. If you are checking a long manuscript such as a novel, it is always easier to work on short sections such as individual chapters. So the limitation is not really an issue for most writers and authors. When you have finished editing a document, you then download it and it will retain all your original formatting. When you work with Word files, it will add a notation in track changes for all the edits you make. Every change made in the editor is marked as “Grammarly” in track changes. If you want to change the track changes editor name, you can. You can read this article on how to modify track changes names in Word for Windows and Mac. With a premium account, you also get a weekly update of your writing progress. You also get a resume of your most frequent mistakes. Grammarly is now an essential tool for me for all forms of writing and I use it every day and all day. Because I write a lot, I get full value from my subscription because of the amount of time it saves me between a rough first draft and the final version. Nothing will ever replace a human proofreader when it comes to the final proofreading of your texts. But by using intelligent online help, it does a fantastic job in locating most errors quickly and efficiently. It also helps me make improvements with excellent suggestions. The free version of the English language grammar checker offers quite a bit of assistance. There are browser extensions available, as well as mobile apps for the Grammarly keyboard. 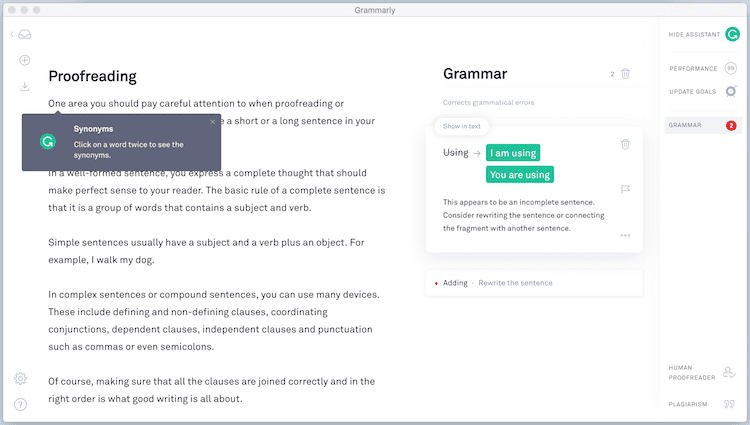 It is an excellent way to try out some of the features of Grammarly and check your writing immediately. However, the paid version with its host of extra features including the editor, vocabulary enhancement, a personal dictionary and choice of writing styles makes it an essential everyday writing tool for me. Another feature that I use from time to time is the plagiarism checker. Before I publish any guest content on my blog, this tool lets me quickly check that all the text is original. With the premium version, you can log in and use it on up to five different devices. A nice bonus. For users of Google Docs, there is good news. It is in beta testing. If you are a premium user, you can turn it on in your preferences. You can subscribe per month. But obviously, it is much more economical to take an annual subscription. 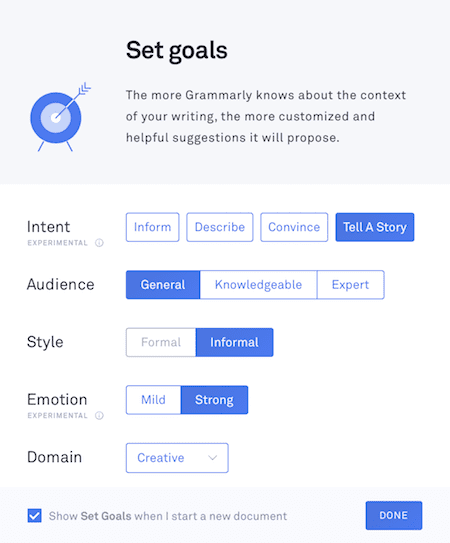 I highly recommended Grammarly premium for all writers, and especially for those who are relatively new to writing, blogging or self-publishing. It can really help you enhance your writing accuracy and variety. It is an efficient tool to check and hone your writing skills and it will definitely help you improve your writing. True. it is not perfect. One bug that annoys me is that when I use the editor with WordPress, Grammarly overrides all ‘open in new tab’ settings on links. The workaround is not to add links until after you have fully checked and edited your text. Another is that sometimes when you click a correction, it will not add a space between words. Then you have to make the correction manually. It is rare, but still a little annoying. As I am a Mac user, it is still disappointing that it does not work with Word for Mac. But I live in hope. Until then, the editor does everything I really need. But these are relatively minor issues. For all the benefits I get, I can live with them. The only comparable app that I would suggest is ProWritinAid. I use it too because it has so many reports that dig deeper into your writing style and consistency. It also comes with free a browser app, but the premium version editor and analyser is really where it truly excels. One very big plus for ProWritingAid is that it is much cheaper. The pricing structure does not offer a per month option. But the basic annual price is less than half that of Grammarly. It also has the advantage of being compatible with Scrivener, which is a huge bonus for authors. You can read my review of ProWritingAid for more detailed information. Good to know how Grammarly is helping you. I got started into writing a year ago, and along the way, came to similar conclusions, that I needed help finding and fixing my writing and tools existed. So like you, I paid for something. Right now, I’m in the middle of a 1 year sub to ProWriting Aid. $40/year. I like what it finds and the report it gives me. I use Google Docs to write, and I don’t like the limitations it has to work with to present the list of problems or to step me through them. I may have to check out Grammarly next, rather than re-upping my subscription. Another tool is AutoCrit, but at $30/month, that’s a little steep for something I don’t make money at yet. 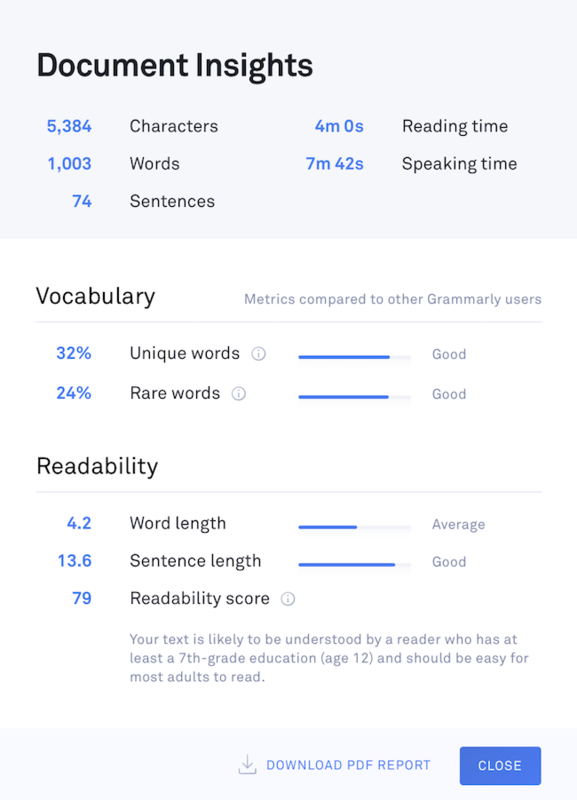 A few questions: Does Grammarly tell you the reading age of your writing? Not really sure about the ideal reading age for adult fiction, do you have a link to any discussions on reading age? Does the plagiarism section also tell you where you may have inadvertently plagiarised your writing? 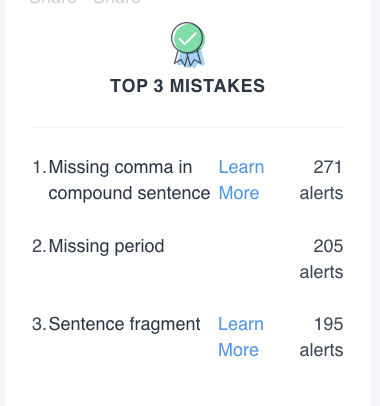 Does Grammarly alert you to errors similar to misuse of ‘your and you’re’, ‘off and of’, ‘to and too’? Thank you for the article, when I use a grammar checker, it’s normally the free Hemingway Editor which has limitations, I’m looking for something with more capabilities. With Grammarly, it’s no to the reading age, but it does have a Flesch-Kincaid Readability score, which I suppose is pretty much the same thing. Yes to all the rest.